It’s fair to say that Malcolm Holcombe is an acquired taste and; as my wife once said, “won’t be invited to join the school choir any time soon,” but since I discovered him; he’s my ‘go to guy’ when I need something to cleanse my listening pallet. In exactly the same way that Bob Dylan can’t ‘sing’ Holcombe can’t; but using a version of talking Blues he uses his world weary and battered voice to inhabit songs like the beautiful Mister in Morgantown (alongside Jelly Roll Johnson) and leaving the casual listener an emotional wreck. 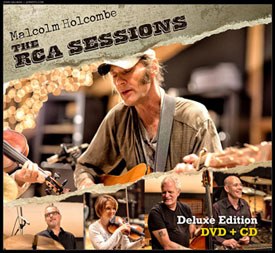 These sixteen tracks are a retrospective of his work between 1994 and 2014; but re-recorded in the legendary RCA Studios in Nashville (hence the title! ); and if there is a God in Heaven will bring this low key genius’s work to a whole new audience. I actually received the album in the week of the Nepalese earthquake; which somehow made Doncha Miss That Water When It’s Gone; somehow even more poignant as it’s a very subtle geo-political song disguised as a love song that originally flew in under my radar; don’t you make the same mistake. As a confirmed Malcolm Holcombe fan I absolutely love the two duets that are included; first the jaunty twang of My Ol’ Radio with Siobhan Maher-Kennedy but A Far Cry From Here with Irish Folk legend Maura O’Connell combines their contrasting voices to create a rare thing of terrible beauty. Many words have been used to describe Holcombe’s ‘style’ over the years and the most used tend to be intense and passionate; and I can’t think of any better way to describe I Never Hear You Knocking and my favourite Holcombe song Butcher in Town. While it wasn’t necessary to include anything new; as these new recordings will have his fans flocking to the record shops in their dozens; there is a brand new song included and it’s a doozy – Mouth Harp Man featuring Jelly Roll Johnson again on said instrument and it’s gone straight into my Malcolm Holcombe Top 10.